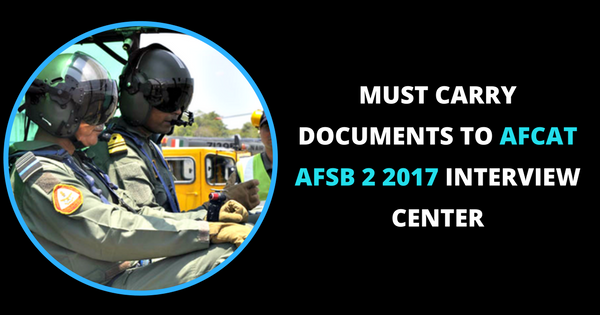 A candidate appearing for SSB interview through AFCAT 2 2017 entry (Result pending) Must Carry these Documents to AFCAT AFSB 2 2017 Interview Center. (a) Original Admit Card.In case if it is not available with the candidate, he/she is to furnish an affidavit stating the valid reason. The reason also needs to be supported by documents like copy of FIR in case of loss/theft of the same. 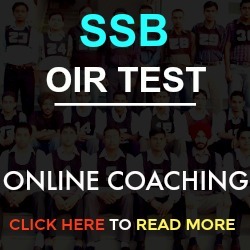 (b) Original Matriculation/ Secondary School Passing Certificate and Mark sheets issued by CBSE/ ICSE/ State Board/ any recognized Board indicating DOB(No other certificate will be accepted for verification of Date of Birth). (c) Original Marks Sheet & Certificate of 10+2 or equivalent (issued by the relevant Board). (i) Graduation Degree(Orignal/Provisional) if applying on the basis of Graduation. 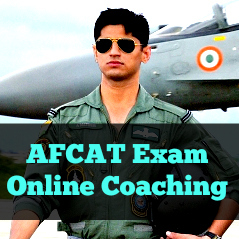 (ii) If applying on the basis of Post Graduation, in addition to (i) above PG degree (Original/Provisional). (iii) Bonafide certificate in case the candidate is appearing in the final year/semester of qualifying examination. In case candidate is appearing in FY/final semester of PG, then he/she is also to produce documents mentioned in (i) above. (iv) Provisional Certificate issued by college Principal is not acceptable. However, Provisional Degree Certificate issued by the University is acceptable. (i) Name of the College. (ii) Name of the University. (iii) Discipline in which Graduation/ Post Graduation obtained. (v) Likely Date of Declaration of Final Result (in DD/MM/YYYY Format). 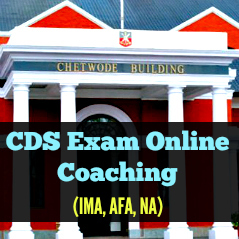 In case the likely date of result is beyond 15 June for course commencing in July or 15 December for course commencing in January, the onus of producing the required documents before the specified date lies with the candidate. 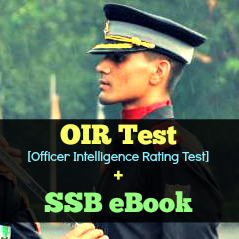 (f) The candidate should not have current backlog at the time of appearing for SSB interview. In case the candidate has cleared the backlog/arrear of any semester , the same should be substantiated with a mark sheet issued by College/Univerisity. Alternately, a certificate clearly mentioning the year of passing & marks scored from the College/ University authority may be produced. Merely re-appearing in that subject will not be construed as clearing the backlog. (i) Percentage of marks obtained in the qualifying degree/examinations. (ii) Methodology/formula used to arrive at percentage. (iii) Whether all subjects studied have been included or not to arrive at percentage. (h) In order to arrive at percentage, all subjects and semester are to be considered without eliminating any non-credit subjects/semester or reducing the weightage of any subject/semester. (i) Three attested photocopies of all marks sheets/passing certificates. 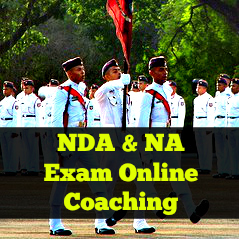 (k) NOC from employers of candidates working in Central/State Governments or Public sector undertakings. (l) Orignal valid Commercial Pilots’ License, issued by DGCA, if applicable. (m) Hard copy of Railway/Bus Tickets(for refund of Travelling Allowances). (n) Proof of Identity: Following shall be accepted as proof of identity. (vi) College ID(Valid only for appearing candidates in final year/semester). (o) Candidates(if recommended) should, preferably, provide details of two Gazetted Officers(not in blood relation) and residing in their place of residence and who know them personally to facilitate verification. Note1: Candidates not in possession of the above documents or those who do not meet the eligibility criteria, should not report to the AFSB, as they will not be accepted for the tests and will be routed back. They will also not be eligible to claim travelling allowances. (a) One pair of White Shirt/ T-Shirt, Shorts/ Trouser/ Track Suit/ Salwar kameez, Socks and a pair of white sports shoes. (b) Adequate writing material (Pens and lead pencils). (c) Clothing, according to season. (d) Medium size locks to safeguard your personal luggage. (e) Two pairs of formal dresses for mess premises and interview. Day 1 Phase 1- Officer Intelligence Rating, Picture Perception & Discussion Tests and document check(for Phase II Candidates). Traveling Allowance(TA): Traveling Allowance by the shortest route for AC-III tier Mail/ Express Trains to and fro for the journey from the place of Call Up or departure (whichever is nearer) is admissible. Change of address, if any, must be intimated to the Board at least 2 weeks prior to reporting date. You shall furnish the hard copy of Railway ticket/ Bus ticket/ Air ticket along with boarding card to the Board, failing which no TA will be paid. The amount of TA shall be restricted to the maximum authorised by the rules and not as per the actual amount paid on journey. The least of two shall be paid to the candidate. be admissible as per the government authorized rules. 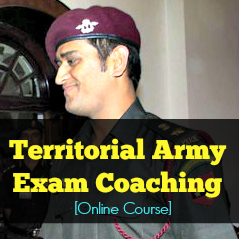 No TA is admissible, if you have already appeared for the same type of entry at any of the Selection Boards. Discipline: Your conduct and behavior during your stay at the Board is expected to be disciplined and orderly. Any act of indiscipline or misconduct will lead to cancellation of your candidature. In all matters pertaining to indiscipline and/ or misconduct, the decision of the President of the Board shall be final and no appeal against his decision will be entertained. Should you try and influence any member of the Board directly or indirectly, your candidature will be cancelled. Sir, Meri graduation ki marksheet me name wrong hai. Maine Mark sheet correction ke liye diya hnu, SSb ke samay mere pass original marksheet nahi hai to kay marksheet ki “XEROX” chal jayegi. 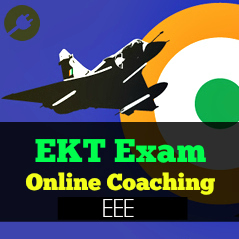 sir,i have missed my higher secondary marklist,but i have pass certificate.i have every other intact including degree certificate.what can i do as i dont have enough time to apply for duplicate from CBSE. pass certificate has all the subjects i have studied and my roll no.i have attested copies of marklist although original is missing. rest all documents are present with me.